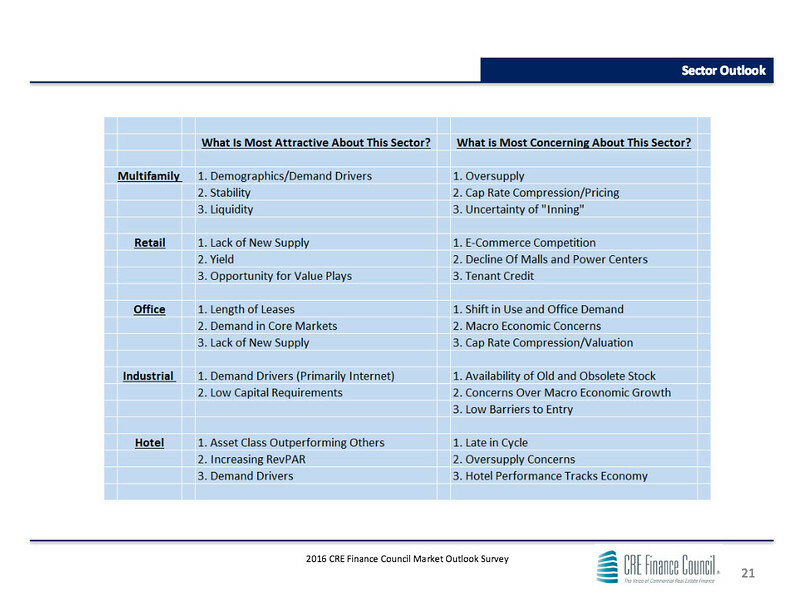 Commercial real estate finance leaders expect favorable market to continue in 2016. The majority anticipate a continuation of the past year’s positive market despite concerns of increased volatility and liquidity concerns. According to an annual survey of Commercial Real Estate Finance Council members, industry leaders expect the market to remain favorable in 2016, with ample credit and capital available to meet borrower demand for new loans and refinances. The CRE Finance Council (www.CREFC.org) is the global trade association for the commercial real estate finance industry. Its members are participants in all aspects of the commercial and multifamily real estate finance market, including balance sheet and securitized (CMBS) lenders, loan and bond investors, private equity firms, service and rating agencies, among others. The U.S. commercial real estate debt market is $3.5 trillion. Respondents believe commercial real estate markets are fundamentally sound. Construction activity is expected to be at or above the average historical rate of 1.9% of existing building stock. Incrementally rising interest rates are not viewed as a significant concern by survey participants. Rising interest rates are expected to result in slightly higher borrowing costs, with capitalization rates and investment yields expected to rise gradually as interest rates rise. Underwriting standards are predicted to remain about the same as in 2015, with loans underwritten largely based on existing rent rolls and the expectation that leases will renew at higher versus the same rates. Survey respondents expressed divergent views on the issue of credit quality and relative investment returns. They split nearly evenly on whether current yields are sufficient to cover potential risk. 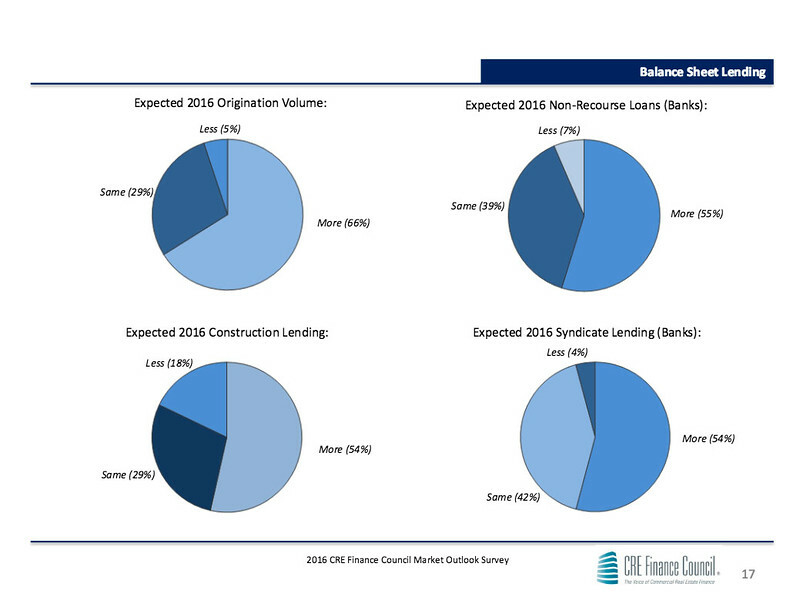 The prevalence of nonbank capital sources is expected to once again increase in 2016. 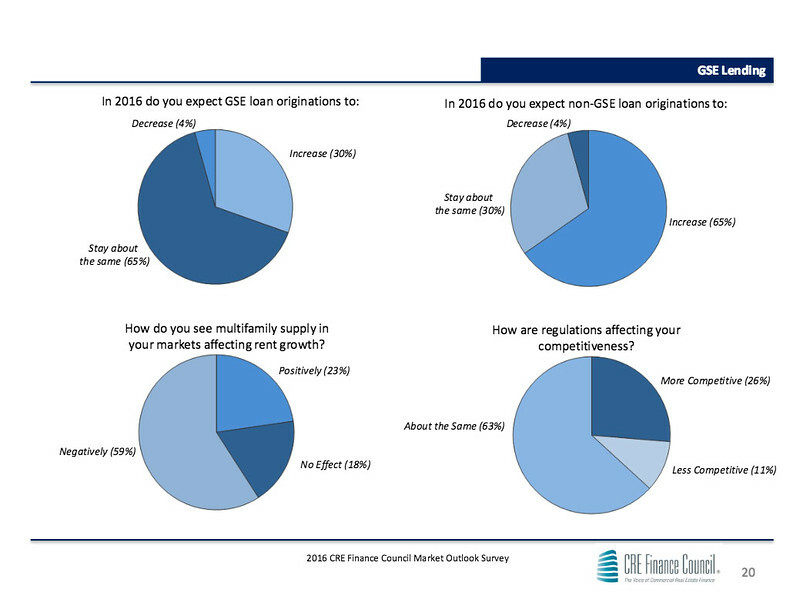 66% of survey respondents expect a higher level of loan origination from balance sheet lenders in 2016. Additionally, 76% of survey respondents expect private capital (nonbank) sources to originate more loans in 2016 than 2015.